Fill a medium saucepan with 2 cups water – bring to a boil, and stir in the quinoa with a touch of salt and olive oil. Cook until just done. Preheat oven to 400 degrees F. Toss sweet potatoes cubes and garlic slices with olive oil, salt and pepper. Spread onto a baking sheet, and cook until done – from 15 to 20 minutes. Once the quinoa is done cooking, place the arugula on top of the quinoa in the pan. Cover and allow to “steam”. Stir together, salting to taste. 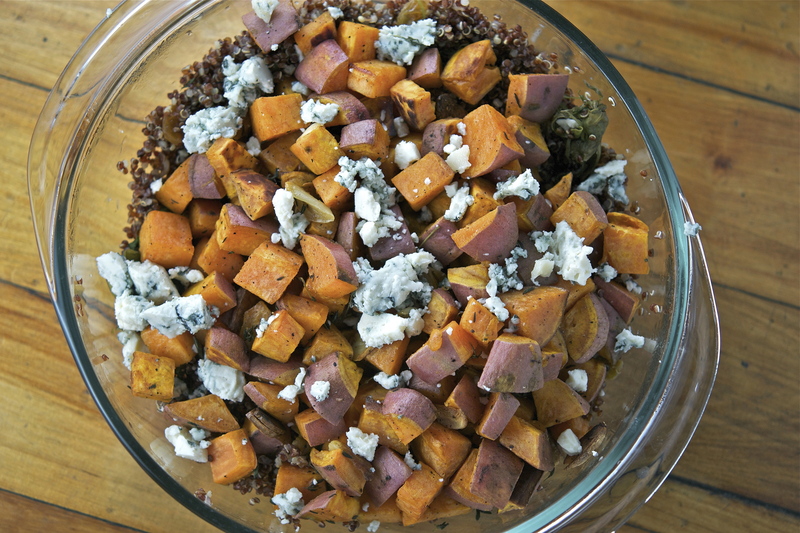 Pour the quinoa into a large bowl, and top with the sweet potatoes and garlic. Sprinkle with blue cheese, and serve as is or stir into a delicious cheesy mess!